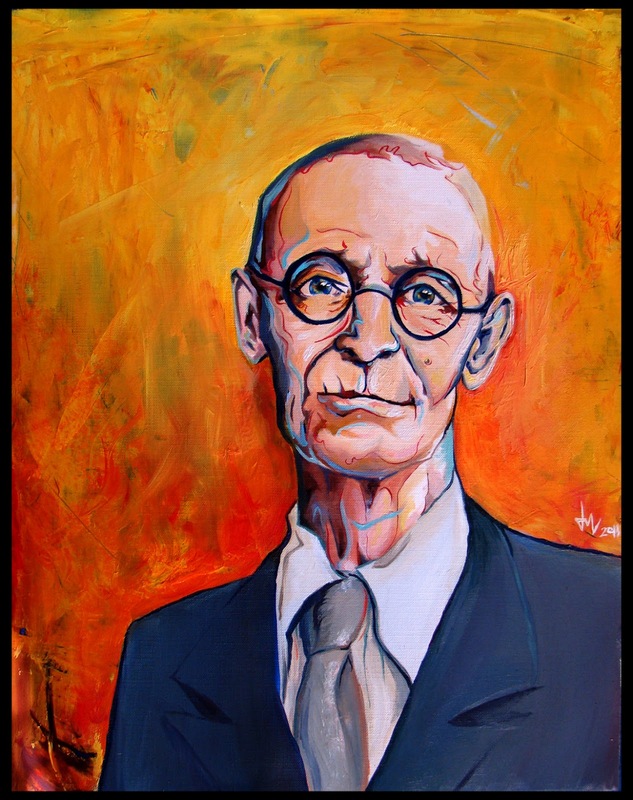 I’ve been a fan of the German poet, novelist and painter, Hermann Hesse (1877-1962) since the 1970s when I took a modern European lit course in college and read Steppenwolf. His other novels include Siddhartha, Demian, The Journey to the East, Narcissus and Goldmund, and The Glass Bead Game. In all his writings Hesse explore’s the individual’s search for authenticity, self-knowledge, wholeness, creativity, universality and spirituality. In a book entitled Reflections that has been translated by Ralph Manheim one can find a rare collection of his wisdom on topics that include: Society and the Individual, The Task of the Individual, Education and Schools, Religion and the Church, Knowledge and Consciousness, Books and Reading, Reality and Imagination, Art and the Artist, Humor, Happiness, Love, Death, Youth and Old Age. In re-reading this book for perhaps the fifth time I’ve come to realize how much the writings of Hesse have influenced my thinking and sensibility, and what a debt I own to him not only as a novelist and poet but also as a wisdom teacher. I can do little better than to commend his books, including Reflections, to the receptive reader. “I believe that for all its patent absurdities life nevertheless has a meaning. I resign myself to being unable to find this ultimate meaning with my reason, but I am prepared to serve it even if it means sacrificing myself. “With regard to pessimism or optimism or philosophies in general, a man who is alive, and especially an artist, cannot readily commit himself to any one. I at least cannot, nor do I ever feel a need of being right; I take pleasure in diversity, including that of opinions and faiths. This prevents me from being a good Christian, for I believe neither that God had only one son nor that belief in that one son is the only way to God or beatitude. Piety always appeals to me, whereas I dislike authoritarian theologies with their claim to exclusive validity. “I have chosen the way of the egoist or religious man, and regard outward duties as secondary to our duties to our own souls. I feel more strongly than ever that my soul is a small part of all human development and that fundamentally the slightest quiver within us is as important as war and peace in the outward world. “Like art and poetry, the religions and myths are an attempt on the part of mankind to express in images the ineffable, which you are trying in vain to translate into shallow rationality. “Freedom from conventions is not synonymous with inner freedom. For the higher type of men, life in the world without rigidly formulated faith is not easier, but far more difficult because they themselves must create and choose the obligations that would govern their lives. “Grace, or the Tao, surrounds us always. It is the light and it is God Himself. Whenever we are open to the moment, it enters into us, into every child, into every wise man. “Clarity” and “truth” are words that we often hear used side by side, as if they meant more or less the same thing. Yet they stand for entirely different things! Rarely, very rarely is the truth clear, and even more rarely is clarity true! The truth is almost always complex, obscure, and ambiguous–every statement especially a “clearer” statement does it violence. “Clarity” is always violent, it is a violent attempt to simplify what is many-sided, to make the natural seem understandable and even reasonable. “Clarity” is the virtue of maxims. Maxims are charming, they are useful, educational, witty, informative–but they are never true. Because the opposite of every maxim is also true. “Knowledge can be communicated, but wisdom cannot. A man can find it, he can live it, he can be filled and sustained by it, but he cannot utter or teach it. A truth can be spoken or cloaked in words only if it is one-sided. Everything that can be thought in thoughts and spoken in words is one-sided. It is lacking in wholeness, roundness, unity. The world itself, the reality around us and within us, is never one-sided. “Reason in the right place is a good thing, and those who insist on following instinct or intuition in realms of life where reason is a good guide will usually come to grief; and conversely, I only contend that reason must not be granted total claims or equated with the spirit. “Generally speaking, the enemies of good books and of good taste are not those who despise books but those who read anything and everything. Well, there are literally thousands of sagacious and provocative statements by Hermann Hesse that are worth reflecting upon. He is a many-sided thinker who seeks to see life entire and whole. He is a universal sage who appreciates all the world’s living wisdom traditions. He honors the differentiated yet integral wisdom of the whole person and all the seasons of life. I hope you will want to spend some time getting acquainted or re-acquainted with Hermann Hesse. He is a man for the ages. Great post. HH is one of my most favorite writers, and his insightful writing and contemporary philosophy I have always found to be highly inspirational. Thanks for the pingback to my post. Much appreciated.